Unibros Technologies Company Career Jobs Opening 2018-2019 Various HR Executive Posts Download Application at www.unibrostechnologies.com. Unibros Technologies Career Job has Recently Announced 2018 regarding HR Executive & Various Job Openings Interested and Eligible Candidates can Download Application Through Official website. Urgent Job Opening Dell || Software Engineer @ Bangalore - Apply Online. Unibros Technologies is a Global Technology and Process outsourcing service provider to the Enterprises in the various verticals like Education, Manufacturing, Retail, Travel, E-Learning, Automobile,Finance and Healthcare. We are offering Mobile Apps, Enterprise Application development, web designing & development & Digitial Marketing. Ready to work on the complete gamut of HR. Sound knowledge of MS-Office (Excel & PowerPoint). Immediate Joiners, Female & Chennai Candidates. 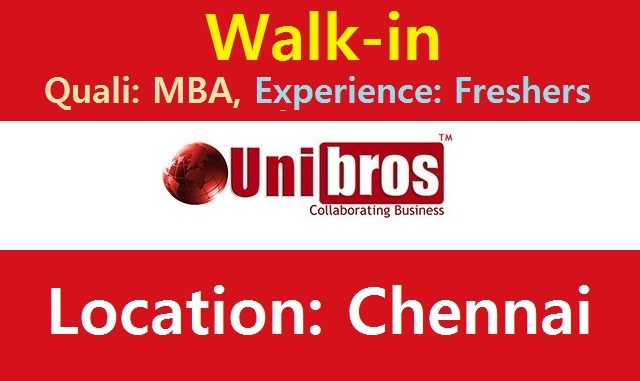 Interested candidates can send their resumes to careers@unibrostechnologies.com (or) Interested candidates can directly walk-in to the mentioned address. Land Mark – Opp.lane to Newline Fashion Showroom."